This week’s BEACON Researchers at Work blog post is by MSU graduate student Nathan Ward. One of the strengths of BEACON is its focus on interdisciplinary research. Through gathering together scientists and educators from different backgrounds, BEACON can address problems that people from one field alone cannot solve. One example of this is Avida, which combines insights from computer science and biology to simulate evolution. Avida is an example of what can be achieved when computer scientists and biologists collaborate together; problems that seem difficult in one discipline are much easier to solve when approached with insight from another discipline. Like Avida, the work I am doing right now is interdisciplinary. I am currently a PhD student in the computer science department with a background in computer engineering, however, one of my PhD advisors, Dr. Julius Jackson, is a professor in the Department of Microbiology and Molecular Genetics at Michigan State University. The work I am trying to do right now is to create software that will simulate the evolution of bacteria starting roughly four billion years ago. The major goal of our software is to discover how evolution shapes the distribution and organization of genes on the bacterial chromosome. Because of this, we named our software: Gene Distribution Lab. Evolution selects for the organisms with the fittest characteristics for their given environmental niche to survive. Likewise, evolution selects for the chromosomes that have the best organization of genes. One feature of chromosomal organization that evolution appears to select for is genes that are functionally related to be next to each other spatially on the chromosome. The observation that bacteria often have functionally related genes close to each other on the chromosome is called the gene clustering phenomenon. Although there are many different models that scientists have proposed to explain the gene clustering phenomenon, we are starting our investigation by looking at one model specifically. The lab I work for has proposed a model called the Limited Protein Mobility Model. This model states that when genes of related function are close together, the proteins they code for will also be close together, furthermore when these proteins are close together they can process the reaction they both interact in better than if they are far apart. Although my background prepared me to write the code for Gene Distribution Lab, grasping the underlying biology was a challenging but necessary step at the start of this project. With my background in engineering and computer science I often find it easier to grasp problems of biology through thinking about these problems in terms I am familiar with. So to really understand the Limited Protein Mobility Model, I wanted to put it in context of an engineering problem. Metabolic pathways in bacteria function a lot like assembly lines. First of all, precursors in the cell are initially processed by the pathway; this can be thought of as the “raw material” that is modified by the assembly line. At each step in the assembly line, a worker will perform some operation on the unfinished product, such as soldering on wires, reshaping the material, adding on paint, or something of that nature. Only after the last step will the final product be useful for what it is intended for. Likewise, in each step in a metabolic pathway, a protein will modify the unfinished product, that is, the intermediate, such that the intermediate is closer to its form as the desired end product. Proteins will operate on the intermediates, which is analogous to how workers in a factory operate on the unfinished product to bring it closer to completion. One big difference between a metabolic pathway and an assembly line is that pathways operate in a different way due to the scale difference and the fluid medium that they are in. Intermediates and proteins are suspended in the cytoplasm of the cell, and move around randomly due to the laws of chemical diffusion. So imagine, instead of a belt carrying everything around the assembly line, all the workers and the unfinished products were drifting around randomly in a pool of thick gel. It would be very hard to complete the final product this way. Each worker could only modify the unfinished product if the right pieces drifted over to them, and even then they couldn’t send the product directly over to the next worker in line. The problem would be exacerbated if the workers were all very far apart, because it would take longer to initially start creating end products and many pieces of the unfinished product (the intermediates), would simply drift away out of reach of any worker. We propose a similar process promotes the gene clustering phenomenon. Genes that produce proteins in the same pathway will tend to cluster together on the chromosome because it is easier to make end products when proteins are close together. Gene Distribution Lab tests this prediction by simulating the evolution of early bacteria. These bacteria start off with a very small chromosome and a number of genes they are required to have to code for proteins in a pathway. The chromosomes then undergo segment duplication, segment deletion, and point mutations which have the potential to disable genes they have. An organism dies if it loses the last copy of a gene necessary for survival. So far we have verified that organisms in Gene Distribution Lab are able to accumulate and dissipate clusters in their chromosome, and soon we will be able to show the effects of the Limited Protein Mobility Model on the selection pressure to maintain clusters. 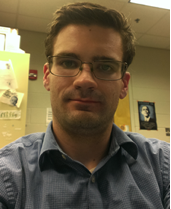 For more information about Nate’s work, you can contact him at wardnath at msu dot edu.